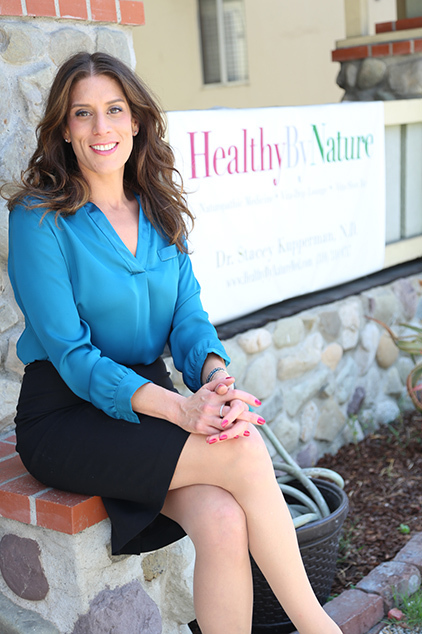 Dr. Stacey Kupperman is a state-licensed Naturopathic Doctor (ND) with training in both conventional and natural evidence-based medicine. She specializes in Integrative Medicine, a field of medicine that uniquely integrates natural and holistic therapies with traditional and conventional medical practices. Her clinical approach takes into consideration the whole person, with initial focus aimed at determining the underlying cause(s) of disease. With the help of appropriate laboratory testing and imaging along with extensive patient information gathering, Dr. Kupperman brings the art to the science of medicine. Treatment plans are individualized to meet each patient’s unique health needs, goals, and desired level of intervention. Dr. Kupperman’s objective is to help each patient restore their health in a manageable and sustainable way, using the safest and least invasive therapies to achieve optimal health. After earning an undergraduate degree in Psychology from the University of Vermont, Dr. Kupperman earned her doctorate in Naturopathic Medicine at Southwest College of Naturopathic Medicine in Tempe, AZ. Following a residency in Naturopathic Family Medicine and Integrative Neurology at Riverwoods Neurological Center in Provo, Utah, she moved to southern California, and opened Healthy By Nature.